1. The University of Maryland, College, Park, Md. I mean, as I was saying — what was I saying? Oh, yes. I was saying this: There are ways to seize our fickle 21st-century attention spans, and then there’s Pulling a Sheen, and I have to imagine Maryland just shotgunned tiger blood (then apparently vomited it all over the left side of their bodies while getting run down by a taxicab). Here is how I foresee it: In 10 years, some third-tier Canadian comedian will mock these uniforms on I Love the ‘10s. In 20 years, Maryland, having endured four consecutive winless seasons, will don these as throwbacks against the ACC’s newest member, the Western Maryland University Fighting Dung Beetles, and we will celebrate them for their quaintness. Grantland staff writer Michael Weinreb is the author of Bigger Than the Game: Bo, Boz, the Punky QB and How the ‘80s Created the Modern Athlete. 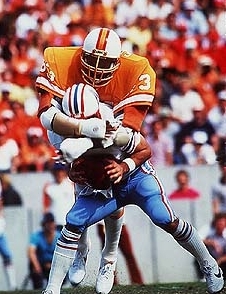 Because while we’re on the topic of uniforms, no one made creamsicle seem badass quite like Selmon did. The lesson here, other than the fact that Selmon is one of the NFL’s oft-forgotten greats: If you’re going to design garish uniforms, at least make them resemble desserts. I have never been to Waco, so for all I know it could be a vibrant and thriving community that is hospitable to both live bears and Freemasons. But since every connotation I have of both Baylor and the city in which it resides is fraught with hellish imagery (though did you know Waco is the birthplace of Dr Pepper, which is nefarious in a different way? ), I am rooting particularly hard for quarterback Robert Griffin (who is so electric he earned that “III”) and Baylor to accomplish something, even if it is a berth in the Meineke Car Care Bowl of Texas. But if not, they’ve still got mammoths. 4. University of Michigan, Ann Arbor, Mich.
For those Michigan fans who have never before attended a night game, here is a piece of advice from someone who has been attending evening football games since his teenage years: Do not start with the peach Schnapps until after 4 p.m.
5. Los Pollos Hermanos, fast food franchise, Albuquerque, N.M. Without divulging any crucial information, allow me to say this about the scene at the end of last Sunday’s Breaking Bad: Never has 15 minutes of television made me so horrified and so hungry at the same time. I really wish that chicken existed.